Melbourne see ms like a misty memory now although it was only probably 2 weeks ago or so. I spent 3 days there by creating my own long weekend. It was a short break, but a break nevertheless - I have not gone anywhere this year so far for holidays, so even though it was a wee, little trip, it was a welcomed distraction from the normal grind of life. I spent the first morning exploring the quaint little laneways. My first visit to Melbourne was some 15 years ago, I didn't even know about those laneways then. My next trip was last year, an in-and-out whirlwind for work so that didn't count for anything. This trip, I finally got to explore those famous little laneways, with their lovely cafes, restaurants and unique boutiques. There were some interesting shops housed in old buildings up rickety stairs with old-fashioned cage lifts, selling kimono material for craft, buttons and vintage clothing. Loved browsing in those shops as they were just so different from the usual stores in the ubiquitous malls. I just had to drop in at the Queen Victoria Market and wandered around a little, and succumbed to the smell of the freshly-made cinnamon donuts being made on the spot in this cute, little van that is parked in the car park. Business was brisk and the simple treat just hit the spot. The restaurant that G had raved about so much, Grossi Florentino, was a let down, solely because I had ordered the wrong item. I thought duck liver would be like foie gras but alas, it was more like chicken or pork liver which I absolutely detest. So the duck liver and mushroom ragu pasta was picked through thoroughly for the mushroom to go with the pasta, while all the liver were left untouched after I attempted a couple mouthfuls with the liver just to make sure that I really hated it. And yes, I really do. I just cannot eat liver (whatever cuisine), I have learnt my lesson and will never order anything with liver (unless it is foie gras) ever again. Another good meal was at Sonia's house. She and her hubby had invited us over to Saturday dinner and after some dramas with the GPS, we finally got to our destination. Her beer-battered prawns were delicious, and I made sure I got the recipe off her. Summary: dinner wonderful, company even better as it was an environment where my past and present coincided. Brunswick Street hosted a whole lot of cafes, it is somewhat like our old neighbourhood, Surry Hills. We had Sunday brekkie at Mario's, another Italian cafe. I only had coffee with toast and jam, but the home-made plum jam was yummy. The European-st yle cake shops in St Kilda were what I was looking for. My 15-year old memories of St Kilda were (1) almost being blown off the Brighton pier (so named I guess because it is modelled after its namesake in Brighton, UK) by the super strong winds and (2) the variety of beautiful cakes stacked high in the huge glass windows along the main street, beckoning you like how the sirens beckoned those unsuspecting sailors. A true temptation indeed. And yield to temptation we did. The difficulty was making a decision which of the scrumptious looking treats we want. The only disappointment was my green tea latte I had with my cake. I should have known a European-style cake shop would not be able to execute a proper green tea latte the way a Japanese-French cake shop would. But the taste was just weird. We enjoyed a lovely dinner at Society Restaurant and I like the baroque ambience. We had half a dozen oysters for starters and the neon-green lime-cucumber sorbet to go with them was just refreshing. My risotto was sufficient even though I had ordered the entree size. G had squid ink pasta. Satiated, we decided to skip dessert and wandered the streets a little, looking for a small bar, in particular, we wanted to try out the Double Happi ness bar in the laneway next to our hotel. Interestingly, the only sign indicating to anyone that they were at the right place was a sign in Chinese "xi" which means "double happiness", a common word or symbol used in auspicious Chinese events like weddings. Obviously, the regulars know they are at the right place, and for the visitors who don't read Chinese, I guess if you had to ask, you were obviously not hip enough for the place. Unfortunately, even though we were able to identify the right spot due to my superb Chinese skills, we decided t o give it a miss because it was so crowded, G figured it would be ages before we could get a drink there. So instead, the old folks decided to forego the (alcohol) bar and went to a coffee bar. The cake and coffee at the well-known Pellegrini's (opened 1954), a stone's throw from our hotel, were spot-on both times we visited. The ambience in this coffee bar was old-school Italian and the staff were lively and friendly, even though every single one of them looked at least 55 and it was late both times we went. None of the painfully hip, young and stylishly gay wait staff one would find in the cafes in our old neighbourhood in Sydney. It really felt like we had stepped into a time warp and perched on a bar stool, the thought I shared with G was how Ed Hopper-like the whole scene felt. The whole city-scape, people, but yet being desolate and alone even surrounded by people. Pelligrini's didn't feel desolate obviously but the scene really reminded me of Edward Hopper's paintings. It was pretty surreal. So here is an account of our Melbourne trip, told in food. Finally I think our foodie luck on this side of the Bridge has turned. Slowly but surely. Feels like it's been quite a while but it's just been a month since we've moved to this side of the Bridge. We felt like a fish out of the water, this is not our usual pond. We missed our usual haunts where we'll be assured of a good feed at a reasonable price. On this side, we had more off our list than on it. Things were not looking up. Until recently. And tonight, we sat back completely satiated and pleased that we have found somewhere that ticked all our boxes. First off, food - Very, very good. Few, simple ingredients, but fresh and well-executed. Our 2 rectangular pizzas were excellent. A fat, succulent prawn perched on a fresh basil leaf on every portion. Lashings of cheese over yummy mushrooms on the other. Crisp dough base. 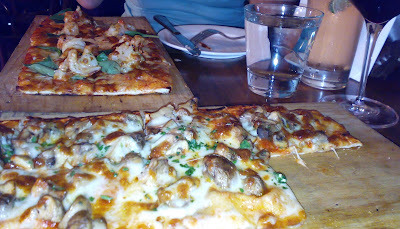 Lovely presentation of rectangular (a departure from the usual round shape) pizza on wooden boards. Oh. So. Very. Good. Next, service - prompt, friendly and efficient. Sufficiently attractive waiters. Enough said. Lastly, ambience - we love the rattan lamp shades dotting the entire ceiling. Cosy restaurant and bar. And the special price of $10 per pizza between 4 to 6 pm didn't hurt at all. We have found the best pizza on this side of the Bridge - and it gives our old fave, Pizza e Birra in our old neighbourhood a run for its money too. I must have ended up with an unusual man with a sweet tooth, and a very sweet tooth at that since he is the only guy who wolfed down my green coconut ice. And kept asking for more. Today I brought a little plate to work and all the men I've offered it to, have politely turned it down. They probably figured that it was going to give them diabetes if they took a longer look at it. It was made of condensed milk after all. The only guy who took some was an Indian chap and I kinda targetted him as a potential "yes" instead of a "no thanks" guy because Indian sweets are so sickly sweet anyway and he would be culturally tuned in to really sweet desserts. But even he would go for half a portion only. So I brought the remainder home to G whose question "Is this all that's left?" warmed the cockles of my heart. Ahhh, a man who knew a good thing when he saw it. With 7 days to go before Mother's Day, I've completed my project to make my Mother's Day card(s). My own mother isn't one who appreciates cards, she thinks they are a waste of money, so she wasn't going to get 1 originally. I was making the MIL a card cos she's one of those who would appreciate a home-made card especially. Then after seeing me make the MIL's card, G requested that I make Denice a card as well as she would appreciate 1 too. So I set down to make card number 2. Halfway through I figured since I am making my MIL and quasi-MIL cards, surely my own mother should receive a card too. That would only be right. And so I started on card number 3. This is what happens when you do not bring your camera and delegate the photo-taking to your dining partner. It comes up in a film noir fashion in this case. Which is not all bad I suppose, if one were going for that effect. The first 2 cafes in Cammeray were full, the 3rd one wasn't full but the people there weren't getting their food from what we can tell so we went further up the road and checked out this one, which is a bit of a Japanese/Western type cafe from the looks of its menu. 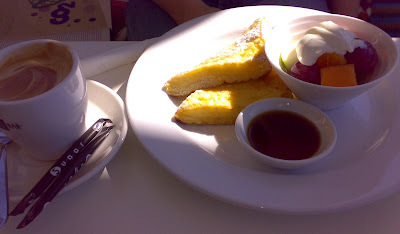 I had the french toast with fresh fruit, yoghurt and maple syrup. It was good, I love the fluffy white bread dipped in egg and fried with a dusting of icing sugar. The coffee could have been hotter but that's the way I like my coffee - really hot. G had scrambled eggs with Turkish bread (roll actually not really Turkish bread but better than not Turkish anything in his opinion). So we are learning new places and new things. And it's looking better with every passing week.